Traditional stream assessment using visual identification of indicator species is time-consuming, expensive and procedures are seldom standardised. Especially small organisms may look similar and misidentifications happen frequently. Using a genetic method to identify the species these concerns are not an issue, as even small organisms can be securely identified using a DNA marker. Vasco Elbrecht from the University of Duisburg-Essen was involved in method development and is proud to see his research being applied in practice: “DNA-based assessment works like scanning a product barcode in the supermarket, the difference is, we are scanning the whole shopping chart at once”. Millions of DNA sequences can be read quickly and precisely using new high-throughput sequencing technology. 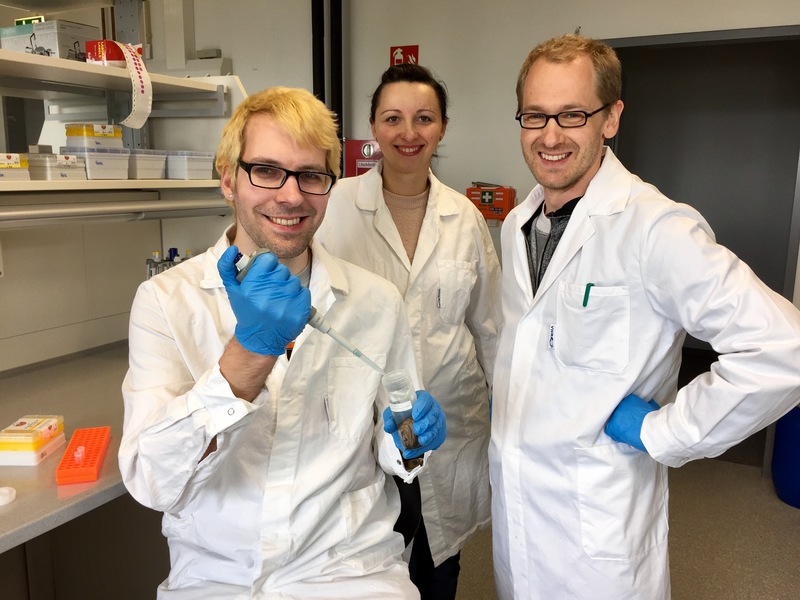 Vasco Elbrecht, Edith Vamos und Florian Leese (left to right) are working to assess water quality of Finnish streams with DNA-based methods. This new study demonstrates in practice that the new DNA bases method is already viable for monitoring. Further, it generates more reproducible and precise taxa lists at equal costs to current methods. Since the beginning of 2017, Florian Leese is coordinating a Europe-wide initiative (DNAqua-net), bringing together scientists and stream manager from 43 countries to put this new method into practice. There is also a video associated with this article detailing the sample processing and homogenisation for DNA extraction. This entry was posted in Methods papers and tagged DNA Metabarcoding, Finnish Streams, Indicator Species, Macroinvertebrate, metabarcoding, Stream Monitoring by Chris Grieves. Bookmark the permalink.